Ready to take your revision from so-so to rock solid? When you complete the sign-up process, you receive a 16-week email series. 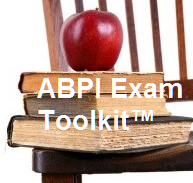 This includes: tips, lessons and special offers to support your revision, boost your confidence, and generally gear you up for your ABPI exam. Once the weekly series ends, you continue to receive updates and lessons/tips from the blog, generally sent monthly. You can unsubscribe at any time. The sooner you start, the more you learn. As a subscriber, you can also download a FREE mind map of the endocrine system based on Unit 3.2 of the ABPI learning materials. Or, if you prefer to check out my MCQ Workbooks, you can download 50 MCQs on Unit 4 (the unit many exam candidates fail). You'll receive a voucher code for both of these when you sign up. P.S. If you haven't already, I'd also urge you to take advantage of the 600 flash cards that are available to you via an app called Quizlet. This is a versatile app that exam candidates use to boost exam performance, improving recall of terms from ABPI exam topics. Previously, I only made them available to those taking tutorials with me. But, I've decided to share them more widely. Read more here.